A couple of months ago, a man told his wife that he was going on a fishing trip. 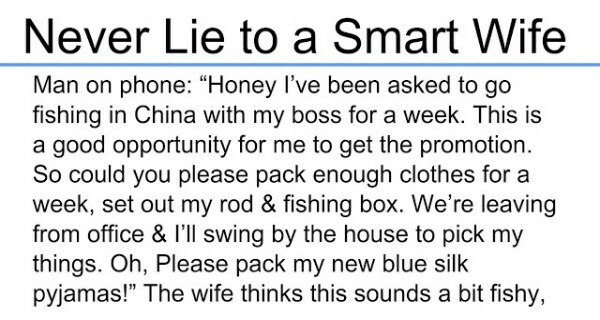 “Honey I’ve been asked to go fishing in China with my boss for a week. This is a good opportunity for me to get the promotion. So, could you please pack enough clothes for a week, set out my rod & fishing box. Oh, and please pack my new blue silk pajamas!” he told her on the phone. The wife knew that something didn’t sound right, but did what she was told. After the weekend, he came home tired. His wife welcomed him and asked him if he caught fish. Blue gill & a few Swordfish. But why didn’t u pack my blue silk pajamas?”, he asked her. “I did,” she told him. “They were in the fishing box”.